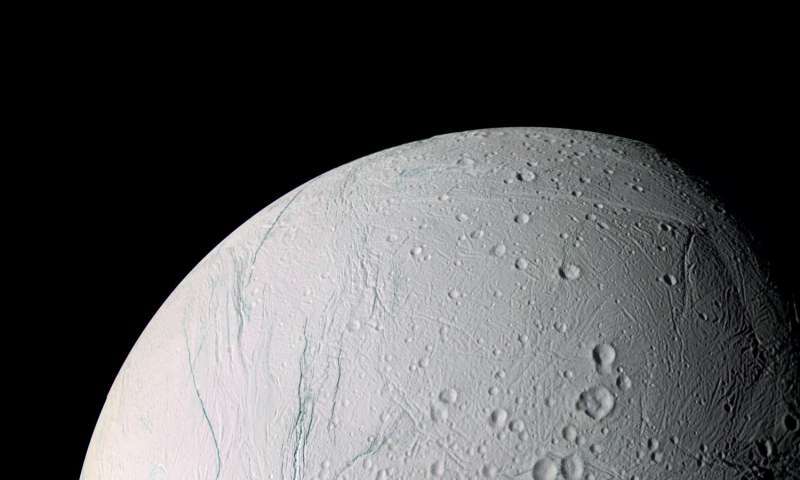 Saturn's icy, ocean-bearing moon Enceladus may have tipped over in the distant past, according to recent research from NASA's Cassini mission. Researchers with the mission found evidence that the moon's spin axis—the line through the north and south poles—has reoriented, possibly due to a collision with a smaller body, such as an asteroid. Examining the moon's features, the team showed that Enceladus appears to have tipped away from its original axis by about 55 degrees—more than halfway toward rolling completely onto its side. "We found a chain of low areas, or basins, that trace a belt across the moon's surface that we believe are the fossil remnants of an earlier, previous equator and poles," said Radwan Tajeddine, a Cassini imaging team associate at Cornell University, Ithaca, New York, and lead author of the paper. In 2005, Cassini discovered that jets of water vapor and icy particles spray from the tiger stripe fractures—evidence that an underground ocean is venting directly into space from beneath the active south polar terrain. 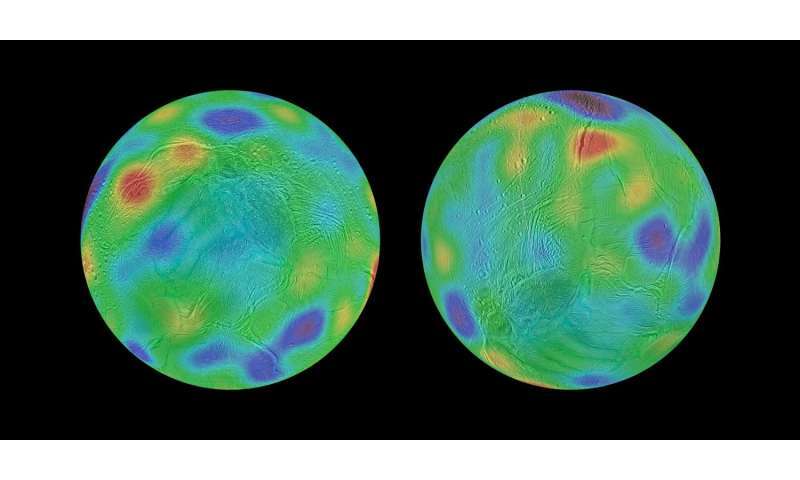 Whether it was caused by an impact or some other process, Tajeddine and colleagues think the disruption and creation of the tiger-stripe terrain caused some of Enceladus' mass to be redistributed, making the moon's rotation unsteady and wobbly. The rotation would have eventually stabilized, likely taking more than a million years. By the time the rotation settled down, the north-south axis would have reoriented to pass through different points on the surface—a mechanism researchers call "true polar wander."